The International Day Of The Dead is a multicultural exhibition, created in 2015 by artist Ari De La Mora in collaboration with the executive director of Granville Island Cultural Society, Barbara Chirinos, presented on Granville Island as part of the celebrations for the Mexican Day Of The Dead. This exhibition re-imagines the transformative nature of the skull beyond the duality of life and death. 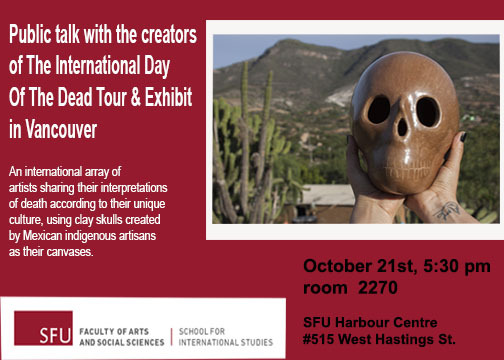 It presents an international array of artists living in Vancouver sharing their interpretations of death according to their specific cultural backgrounds and artistic styles, using clay skulls as their canvases. 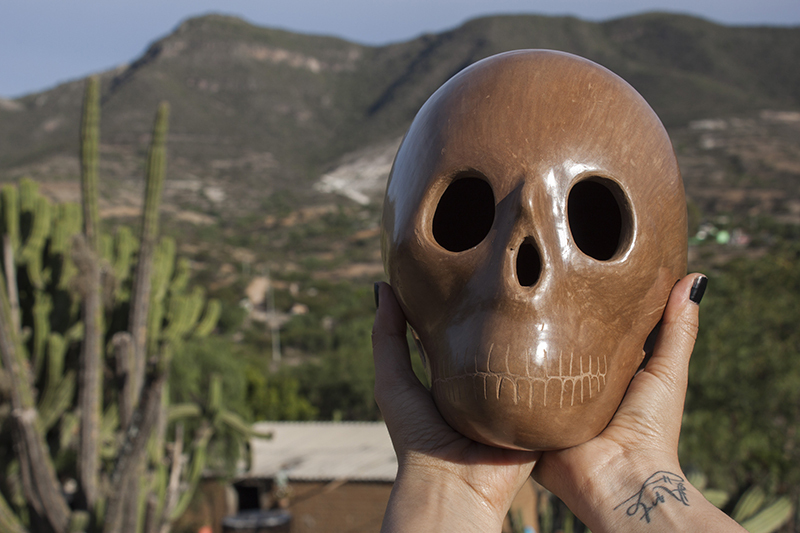 The clay skulls used for The International Day Of The Dead were handcrafted in a small region called “Los Reyes Metzontla,” in the state of Puebla Mexico (near Mexico City). The ancestors of this region belong to the “Popoloca culture.” This group has been creating pottery using the soil from their motherland since ancestral times. 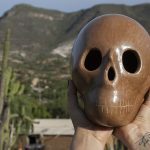 We will learn about the Popoloca culture and the ancient process the artisans from this group used to create the skulls that the artists are using for the exhibition. Participating artists from Latino America such as Mexico, Colombia and Cuba, will be present to talk about the meaning behind their pieces. Vancouver based artist Ari De La Mora is a self-taught figurative painter, born and raised in Mexico. She holds a degree in Advertising with a Specialization in Visual Arts applied to Marketing & Advertising. When she moved to Canada she started to collaborate with the Vancouver Art Gallery with work practices then she had the opportunity to become a Tour Liaison with school groups. Her work is noticed for the focus on the female figure and the influence of the Mexican custom and folklore, rich color, mysticism, masks and skulls. Her paintings have appeared in collective exhibitions in Mexico, United States,Canada,Italy and Spain, and have been featured on magazines and TV shows in Canada. She has also collaborated in public art programs for the city of Vancouver. Creator and curator of the multicultural project The International Day Of The Dead in the city of Vancouver. José R. Urbay is a Cuban-Canadian visual artist and graphic designer graduated from the Institute of Design in Havana. He has exhibited his artwork internationally in solo and group exhibitions in Havana, Madrid, New York, Brussels and Vancouver. He finds inspiration in his personal memories, spirituality, religion, nostalgia and the landscapes of his beloved island. Sandra Díaz is an artist/designer with a BFA in Visual Arts from the Emily Carr University of Art and Design, living and working in Vancouver since 2003. Born and raised in a small town north of Bogotá, she grew up in the midst of a tumultuous political era in a dense and lively culture, Her work looks to depict this on-going process of defining an identity, particularly from a female perspective and in response to conceptions of male/female dichotomies.